On 23 October 2010, I was staying with my parents in Canberra. We went to the National Library. 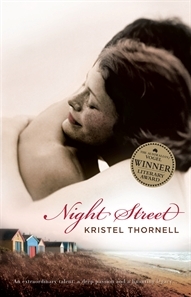 In the bookshop there I bought Night Street by Kristel Thornell. It was the winner of the Vogel literary award in 2010. The main reason I bought it, though, was because there was a little sticker on the front cover for a competition to win $3,000 from Allen & Unwin, the publisher. The money had to be put towards creative writing courses and/or a manuscript assessment. I have written short stories before, and have won the odd competition in local newspapers. I have written one novel, but it's still in its first draft and I hate it too much to do a second draft. I hate my own characters. I've been too busy to write much in the last couple of years, but winning this competition is everything. I am motivated and inspired, and I have ideas gushing. I am going to make the money stretch as far as possible.